Whether you’re a fan of the McDonald’s franchise or not, the story of Ray Kroc, the man who turned McDonald’s into a fast-food giant, is still nothing short of amazing. By the time Ray was in his 40s, he had worked in various different fields. Among his many jobs, he had worked as an ambulance driver, a radio D.J., a jazz musician, and my favorite, a paper cup salesman. It wasn’t until Ray was 51 that he stumbled onto the McDonald brothers and history was made. As I have mentioned before, a common trait among us Late Bloomers is the ability to do a lot of tasks well, thus resulting in our attempt at multiple hobbies or careers. While some consider this trait to be a curse, I find it a blessing. 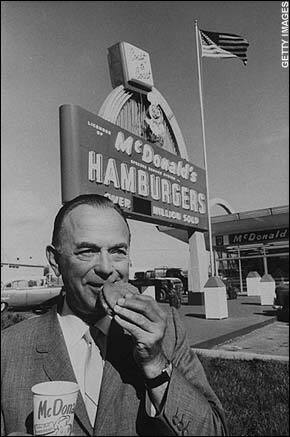 In the example of Ray Kroc, had he not been a milkshake machine salesman at the time, he would have probably never met the McDonald brothers. Timing is everything. If Ray Kroc had met the McDonald brothers 20 years earlier, would he have had the skills, experience, maturity and knowledge to make McDonald’s the monster success that it is today? Definitely not! Ray stumbled onto his opportunity at exactly the right time. This entry was posted in Uncategorized and tagged Kroc, late in life, McDonald's Late Bloomer, Ray, Ray Kroc, stories, success stories. Bookmark the permalink.